Ross and I had a little date night the other week and we ended up at AMBLI DTC per recommendation from my mother-in-law - for those of you that don't know, Ross' mom is a really talented cook so whenever she goes out and likes a restaurant, we're always eager to try it out! AMBLI's main menu is centered around tapas, and small plates with Indian influenced flavors. The restaurant is right in the Denver Tech Center off of Belleview. Be prepared for great service and a lovely ambiance when you dine here. When we arrived at AMBLI, there were musicians playing in the main dining area. Since it was so nice outside, we requested to be seated on the patio and since the patio doors were left open, we could still hear the musicians playing inside -this was a great touch so customers on the patio could enjoy the weather and not miss out on the tunes. There's the babe enjoying his Tito's <3. When we visited AMBLI, we went on a Thursday so had the option to try out their "Chef's World Tour" ($35/pp) menu. On the specific Thursday night we went, the CWT menu would be taking us through Italy. Our darling waitress from Chicago, Donna, suggested we give the CWT menu a try since that menu changes frequently (shot-out to Donna for being such an amazing server - she made our dining experience so fun!). We followed Donna's advice & opted for the Italian CWT menu, but not before we tried some of AMBLI's regular small bites - or as they call them "Introductions". We started our Introductions off with the Sake Style Lobster Shooters (4/$14) and Shishito Burrata ($8). Sake Style Lobster Shooters? #DEAD. My absolute favorite thing we had out of our ENTIRE meal. AMBLI puts fried lobster dumplings in sake shooter glasses and then pours piping hot, red coconut curry over them. Now on to the Shishito Burrata. The Shishito Burrata is toasted bread with burrata, which is milk cheese made from mozzarella and cream, and then tomato garlic shishito jam in-between the burrata and bread. The bread is then topped off with balsamic vinegar, basil oil, and scallions. This burrata was delicious and we would 100% order this app again but the lobster shooters stole the show. Once we finished our Introductions, it was time to start with the Chef's World Tour menu. The Ceaser Salad was up first from the CWT. This Ceaser Salad had some twists from your standard ceaser salad such as the anchovy dressing and pecans - the parmesan bread crisp was a nice touch! I enjoyed the creativity brought with this salad but it was a bit underwhelming and could have used more dressing (#ilovemesomesauce). Per our waitress Donna's recommendation, we then added in the Beef Samosas (3/$10) from the regular menu to our meal. These pastries were filled with savory beef, tamarind and cilantro chutney. We were getting fairly full at this point so the heaviness of this fried plate wasn't the best timing wise seeing that we had already enjoyed a fried app - the lobster shooters. The samosas were good; just not my fav. At this time, AMBLI's sommelier came over and gave us two free glasses of Cabert Pinot Grigio which was SO sweet and a nice touch (we had opted out of the wine pairing with the CWT menu and gone with Tito's instead #titosforever, BUT Ross and I will never turn down a good glass of wine). 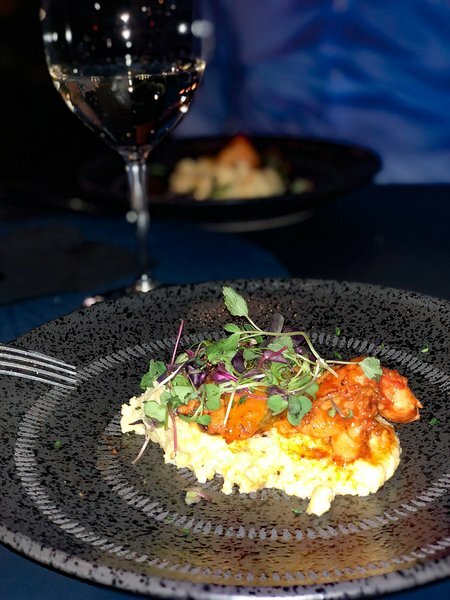 Our first main entree arrived with the wine pairing & we were ready to dig into our Polenta a la Cocco e Frutti de Mare. You guys. YUM. Just straight up Y.U.M. This polenta was a V close second to the lobster shooters as being my favorite thing we had at AMBLI. The polenta was coconut and then topped with shrimp, clams, muscles and octopus. So freaking good & the Cabert Pinot Grigio paired with this dish beautifully. Next up came the Lamb Ragu with Homemade Pappardelle and then topped with truffle parmesean. This entree was just ok; & you guys know how much I like ANYTHING truffle so that's saying something. BUT, also keep in mind we had gone through a lot of food at this point, so us being full didn't help when trying to enjoy this dish - it sure did photograph well though! If the Pappardelle would have had more sauce (#alwaysmoresauce) and more truffle parmesean on it, it would have been better. Next came dessert which was a Fico and Sweet Goat Cheese Pizzetta. This dessert was the perfect top off to our meal and I love me some goat cheese. Yummers - Ross and I both really enjoyed this dessert. Ross and I will definitely be dining at AMBLI again soon and this time I'm eager to try more from their standard menu....including 2-3 orders of those lobster shooters lol #obsessed. Thanks again to Donna and the AMBLI sommelier for going out of their way to make our dining experience an enjoyable one! Head on over to AMBLI and enjoy Denverites!